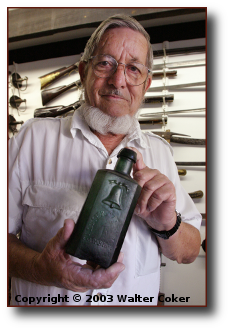 Jack Williams (1925-2011) was an expert in Colonial History and Antique Weapons. In the early-sixties he opened the Gun Shop and Museum of Weapons in America`s oldest city Saint Augustine Florida. Williams is well known for discovering the lost site of Fort Mosa (Mose), the first free-black settlement in what was to become the United States. The site saw significant action during the War of Jenkins` Ear in 1740 and the Patriot War in 1812. Williams was honored for his discovery with the de Aviles Award in 2003. The Jack Williams collection of Antique Firearms, Edged Weapons and Rare Artifacts is unique. 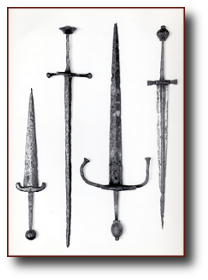 It contains examples of both the elaborately decorated weapons of the rich and everyday weapons of the Spanish, English and French Colonial periods. The collection also contains many items like this eighteenth century Mold Blown Bottle found by Williams near Fort Mosa. This website sets out to be a virtual museum of the Williams collection. The column on the left-hand side of each page is both a menu and a category / item index. Clicking on a category like Early Breach Loaders or American Civil War jumps to the web page for the first item in that category. It also expands the index to show the other items listed under that category. As new items and categories are added to the site the menu will grow and change. You can also navigate the site one page at a time using the arrows at the top and bottom right of each page. 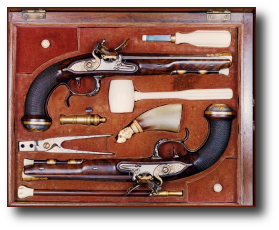 This set of Napoleonic era Dueling Pistols in their original case, has ivory tools and is heavily ornamented with gold. The pistols were made by Chomatt at the St. Etienne Armory. The pistols and tools are in mint like condition. Unlike some examples of the period these pistols are elaborately decorated without being gaudy. An example of the finest workmanship of their time. Jack Williams was fascinated by the Age of Conquest and the Conquistadors. He was especially fond of relics excavated in the Southeast dating from the time of Hernando De Soto and in those excavated in the Southwest dating from the time of Francisco Vasquez de Coronado. Selected items from the Jack Williams Collection are available for purchase. The Collection is currently being cataloged. If you would like to be notified when new items become available please email us with your contact information at info@WeaponsCollector.com. You can also leave a voice message at (904) 417-8074.